Not sure how many of you are participating in Tim Holtz’s Creative Chemistry 102, but Day 2 was all about stencils. Now I admit to being stencil obsessed, but when you can’t draw a straight line, the things you can do with stencils are amazing. Tim showed a technique yesterday of sketching with the stencils. If you are a little on the OCD side and can’t handle hand lettering, you will LOVE this! For my stenciling card I used the embossed stenciling technique with Distress Ink and Wendy Vecchi’s clear embossing paste. 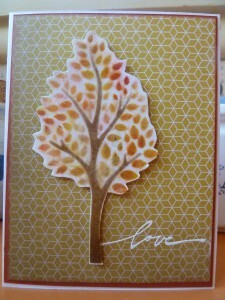 I love this tree stencil and decided it would make a fallish, bright and happy anniversary card. I used some fabulous Stampin’ Up’s Designer Series Paper Stacks and a Very Vanilla and Cajun Craze for the card base layers. Photo is not great….next project to work on. This entry was posted in Cards, Uncategorized and tagged WV Stencils. Bookmark the permalink.